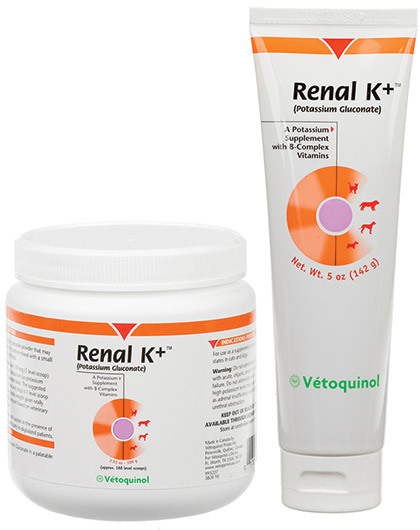 Renal K+ is a supplement for adult cats and dogs in a potassium deficient state. Water, Pyridoxine Hydrochloride, Riboflavin 5’-Sodium Phosphate, Sodium Benzoate, Sodium Carboxymethylcellulose, Sucralose, Thiamine Hydrochloride. Inactive Ingredients: Brewer's Dried Yeast, Hydrolyzed Fish (enzymatic), Hydrolyzed Poultry Liver (enzymatic), Mixed Tocopherols (a preservative), Sodium Acid Pyrophosphate, Sodium Sulfate. For Adults Dogs and Cats: 1 level scoop per 10 lbs. (4.5 kg) of body weight. Give orally twice daily. Powder may be sprinkled or mixed at mealtime. Adjust amount based on veterinary recommendations.